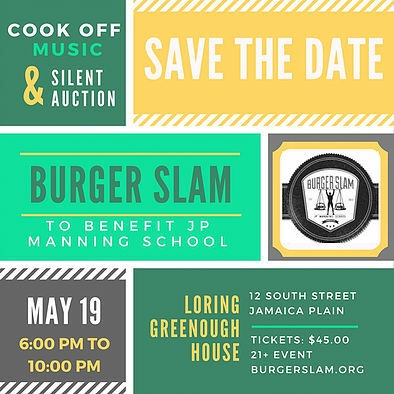 Burger Slam '18 will take place on Saturday, May 19, 2018 at 6:00 PM at the Loring Greenough House in the heart of Jamaica Plain. The seventh annual Burger Slam is a friendly cook off competition between local restaurants. It is organized by parents at the JP Manning Elementary School, a Boston public school in Jamaica Plain, MA. What began as a school community night has grown into a city-wide event, attracting foodies in the area and support from generous sponsors. The primary goal of this event is to celebrate the restaurant community and to raise funds to support a strong curriculum for the kids & teachers who work so hard at this small public school. Every ticket includes a slider hamburger from each restaurant, sides, desserts & one beverage (beer/wine/soda). Vegetarian option available. Live music, cash bar, and great company included! The fundraiser is open to the public ages 21 and over who want to come and taste some of Boston's best burgers and vote for their favorite while raising money for the kids at the JP Manning School. Donation tickets will be used to sponsor JP Manning School community members who otherwise could not afford the event price. 100% of the proceeds go to the JP Manning School. Only 200 tickets available, get yours before we sell out!